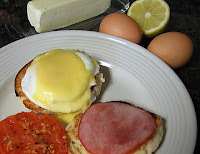 Here's a quick and easy Hollandaise Sauce you can make in 2 min. that will make it possible for you to have Hollandaise Sauce anytime! You won't believe it..... we use this all the time not only on eggs (makes a mean Asparragus and Hollandaise Omelette too!) but vegetables and fish as well, plus you can have variations of the sauce as well, like Bearnaise Sauce which is fantastic! (don't burn) until it's bubbling. Turn the blender on and leave it running, covered of course but take the center part out so you can pour in the hot butter. Then slowly drizzle the hot butter into the egg mixture, while the blender is running, until all the butter is poured in and your sauce has the texture of a light mayonnaise (this is how you make mayo too!.. real easy), it will only take 1 or 2 min. If you want it thicker, add more yolks. My idea of Sunday Brunch was an Omelette and since I had so many filling ingredients to choose from, I knew it would be great! 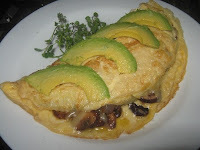 According to the BBC food website, the omelette is thought to have originated in ancient Persia. Beaten eggs were mixed with chopped herbs, fried until firm, then sliced into wedges in a dish known as 'kookoo'. This dish is thought to have travelled to Western Europe via the Middle East and North Africa, with each country adapting the original recipe to produce Italian frittata, Spanish tortilla and the French omelette. How about that for some interesting background info.... I love stuff like this! Fillings, see suggestions below but have them ready. The egg will cook quickly. to make sure it's cooked well. Now turn it over once more, lower the heat to the lowest setting and place your filling ingredients onto one half of the egg surface (you will be folding the other side over this) and fold over the other side to cover the filling. Cover the whole thing with a lid or another pan for 1-2 min. Turn off the heat and let rest 2-3 min. Serve. So that takes of the early part of the day yet still leaves me to prepare dinner..... Continuing on our Atkins day and thinking about what's in my fridge I come up with "Arrechera al Carbon", a dish we all love and really enjoy, especially on a weekend when we use the grill.... first to marinade the meat with some olive oil, wine vinegar, salt, pepper, bay leaves a touch of Dijon Mustard. Leave it in a pan, in the fridge, until about 1 hour before cooking so the meat can come to ambient temperature which is best. As side dishes we will have a great "Guacamole" along with roasted green onions who are dipped in olive oil and lemon and then set on the grill to get nice and blackened. Ricardo (since he's not on a full Atkins, can have some Rice cooked with beef consome, onion and peas), but we will have a green salad with a Mustard Vinaigrette instead. Anyway, since we've been so good on our diets lately we will have a little reward tonight in the form of a great "Green Lemon Meringue Pie" to keep us motivated to keep going, besides, we all need a little "something" now and then. And as long as we have a small piece, it's ok. Here's a great and very easy recipe to try too. In medium bowl, combine milk, lemon juice, and zest; blend in egg yolks. Pour into cooled crust. Preheat oven to 325 degrees F.
NOTE: (Read first): for perfect meringue and pie: Be sure to beat in the sugar very well. It helps to add the sugar a little bit at a time. You must make sure that the filling is VERY hot as the heat from the filling will cook the bottom of the meringue and it won't turn to water. 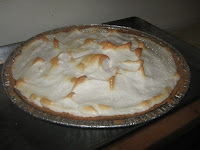 The meringue should be spread evenly over the filling and it must touch the sides of the crust all around. That will give it something to hang onto and the meringue won't shrink. Never cook the meringue in a very hot oven for a short period of time. It just doesn't have enough time to cook that way. Instead, turn the oven down to 325. Cook the pie for at least 20 minutes, but 30 minutes is better if it isn't getting too brown on top. You will have a perfect meringue every time. PIE CRUST- Made from store bought or home made cookies! Heat oven to 350 F. Once done you will bake the cookie crust for about 10 min. and then let cool before filling. Put the cookies into the blender and blend until you get an almost fine crumb mix. In a bowl, put the crumbs and pour in the melted butter. Mix well until all the crumbs are moist. You can add more or less butter, as long as the crumbs hold together when you pinch them. Put the crumb mix onto your pie plate and flatten out with a flat bottom glass or large spoon so that it spreads evenly on the whole pan and up the sides. Compact well and make real even. Bake for 8-10 min. Cool then fill. I've used lemon cookies, ginger snaps, coconut cookies are great for the lemon pie, vanilla wafers; for other types of pies I've used Oreos (but without the cream center, I get the kids to scrape it off). With cookies you don't need to add any more sugar since the cookies are already sweet enough, but try your own combination, you'll see how great this works!